This is Hank! In the years that I have served this area, these are the questions I get asked most often. If you don't see the answer you are looking for, please call me at 504-858-5045 and I will be glad to assist you! In the FAQ section below, I have also included some pictures to help give a clear understanding of the answers. I hope this page is helpful. 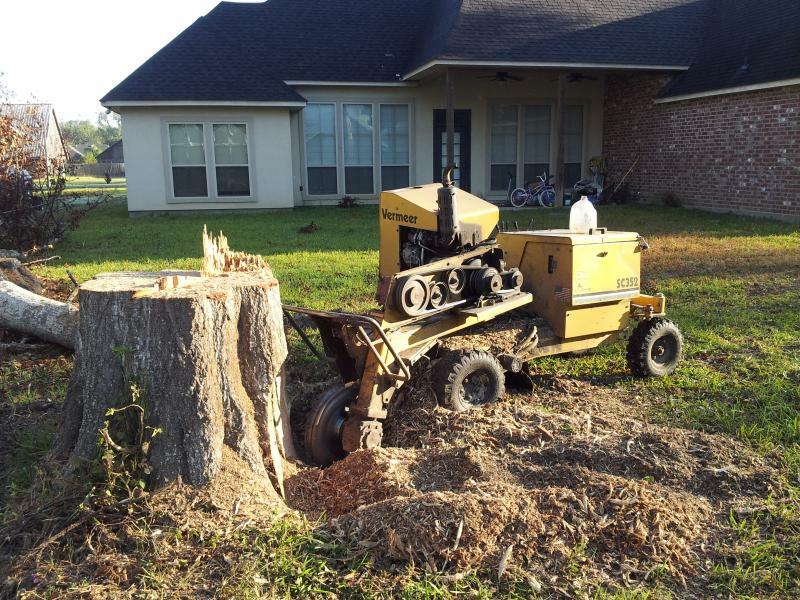 Stump Grinding is the most cost effective means of stump removal possible without having to wait decades for nature to take its course. It involves the use of a powerful machine that has a business end (see picture below) that looks something like a saw blade on sterroids. 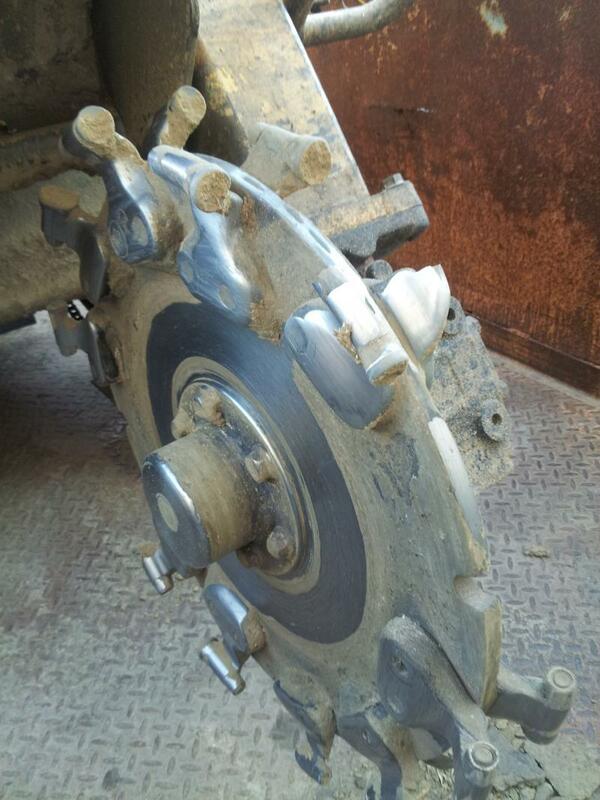 The round extensions off the perimeter of the cutting wheel are the teeth that do the actual cutting. The cutting wheel is mounted to the machine on a boom that is moved left to right and up and down by hydraulic controls. This enables the operator to quickly grind the stump into a pile of managable woodchips. What are my options for stump removal? Natural Decomposition: Mother nature is free, but she works very slowly. The stump will rot away in 7 to 1,000 years depending on the size and the species of wood. The average pine stump takes about a decade. Chemical Decomposition: Some chemical treatments can speed up decay, but it still takes years for that to work. 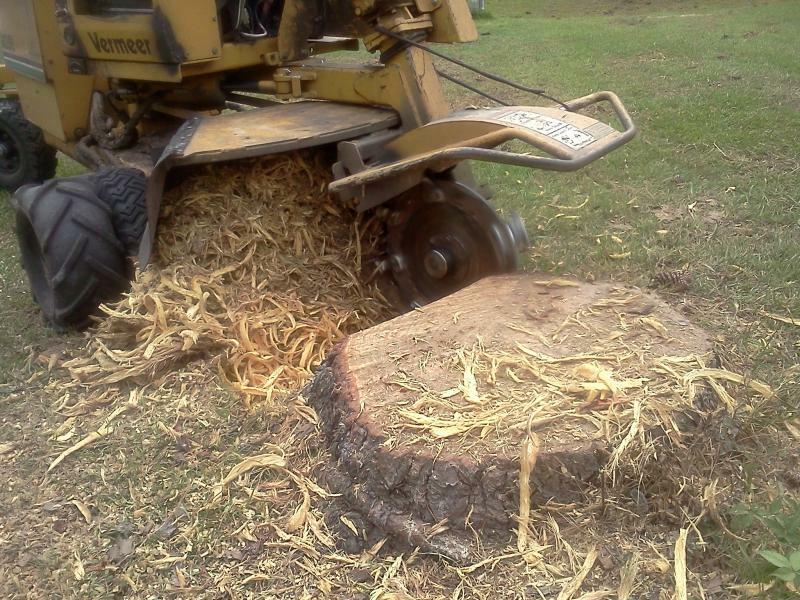 Stump Grinding: This is by far the most economical means of speedy stump removal. It takes a few minutes to a few hours depending on the size of the stump. Your stumps can be ground to mulch almost immediately. 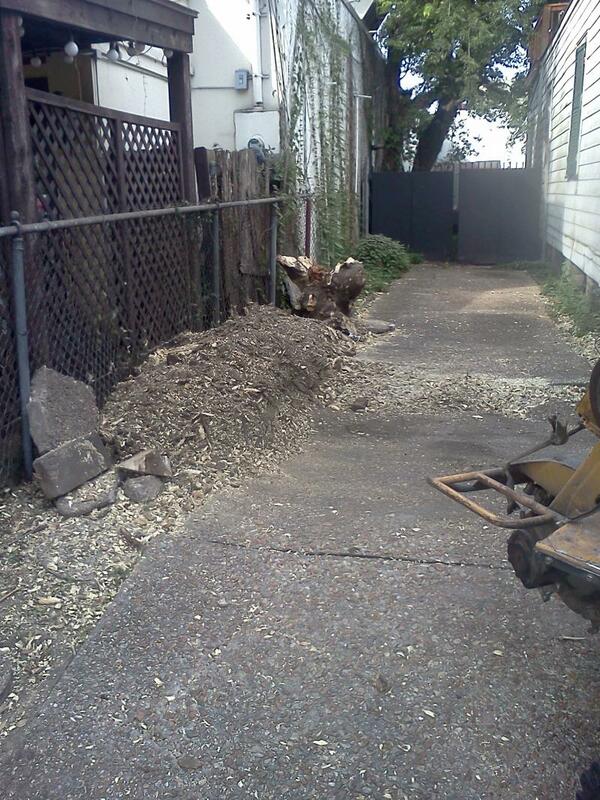 Excavation: This is the most expensive means of stump removal and we do not offer this service. It involves a large machine known as a track hoe or excavator to dig out the entire stump and root structure. 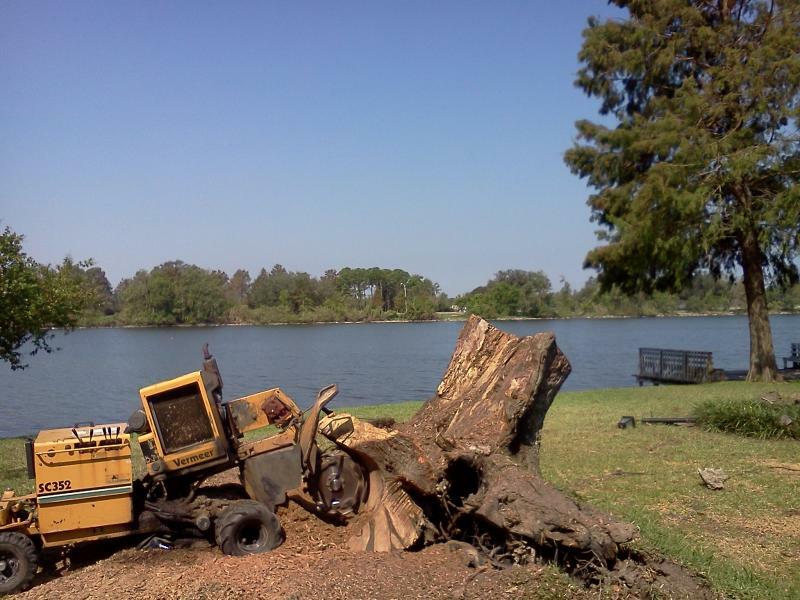 Stump grinding jobs can be as low as seventy-five dollars; excavations are seldom less than a thousand dollars. The reason for this is the expense of getting very large and very expensive excavating machinery to your jobsite. Also, the size of excavation equipment makes this process prohibitive in small and confined areas. Stump grinding machines are much smaller and can get into much smaller spaces. Burning: Some people try to burn their stumps out but then they usually wind up calling Hank. The problem is that the stump is in the ground where it can access ground moisture to keep it moist inside so it never dries out enough to actually burn. The other problem with burning is that, because the stump is in the ground, you can never get enough oxygen to it for it to burn. I have been to many jobsites where people have tried to burn their stumps and only scorched the bark...the wood inside is unscathed! How much does this type of stump removal cost? Most people find that stump grinding is less expensive than they expected. Just call us at 504-858-5045 and we will come out and give you a free, no obligation quote on your job. Since stumps come in many shapes and sizes, it isn't posible to publish a price scale that is fair to both the customer and the service provider. Also, when we quote a job, that is a final price to which there are no hidden additional fees or upcharges. If we tell you the job is $100, that is what the final price will be, nothing more unless something else was agreed to before the work was done. The answer is yes, if that is what you want. When I come to a jobsite to give a price, I will always ask what your intentions are. I can just grind it deep enough to allow for some dirt and sod to be placed over the area later, or I can grind out through the base of the stump leaving a hole that you can plant a new tree in. Naturally, it is more expensive to completely grind everything than it is to leave some subterranian roots. This is why I always discuss your needs when pricing a job. I will work wth you to see that your particular needs are met. What will the location look like after a stump is ground? You will be left with a pile of mulch about two to three times the size of the unground stump. Unless agreed otherwise, the shavings will be raked into a hill and any surrounding man made surfaces will be swept free of any debris. 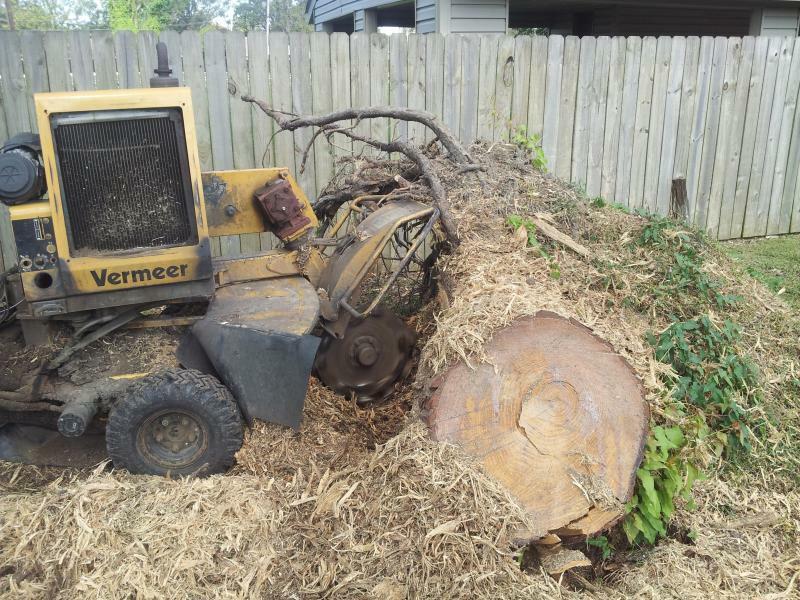 We do not haul away stump shavings but if you need this service, I can certainly recommend reputable people who can provide that service for you. Can I use the shavings for anything good? Yes, the stump shavings can be used as compost or garden mulch. The shavings can also be used to fill small holes in your yard or be spread evenly throughout the yard to boost the level of organic material present as a natural fertilizer. Note that these chips will decompose fairly rapidly in their reduced state, so when they are used as filler, they won't last too long. Can stump grinding be done without damaging my lawn? Yes. My machines are on rubber tires that evenly distribute weight. In some cases, it may be appropriate to wait for a period of dry weather for the ground to be good and firm but usually there are no problems unless it has been raining a lot. Typically, if you can walk on your lawn without sinking into it, you will not have any ruts from any of my machines. Can you get in my back yard? Almost always, yes. I just need an opening of at least 36 inches for my larger machines. Sometimes this means removing a gate or a short panel of wooden fence, but in the 14 years that I have been in this business, I can count on one hand the number of stumps I couldn't reach. I also have a smaller machine which only requires a 24 inch opening for access. This machine enables me to service stumps in very restricted locations such as elevated garden beds, behind swimming pools and in alleys. I typically have three sifferent sized machines with me at all times, so regardless of the situation, immediate service is often possible. Can you grind a stump that is against the side of a building or fence without damaging it? Yes, provided that the space around it is clear enough that I can get in close to a 90 degree angle to the structure in question. My machines are precisely maneuverable and we can do some very precision work with them, even shaving stump wood off the side of walls without damaging the wall. In fact, I have certain tree companies that call me exclusively when they have jobs like this because they know I can do it without any problems. In the picture below, I ground one stump against the fence and dislodged the other that is sitting in the background. My stump has a fence running through the middle of it. Can that be completely ground? Absolutely, yes! The process goes like this. 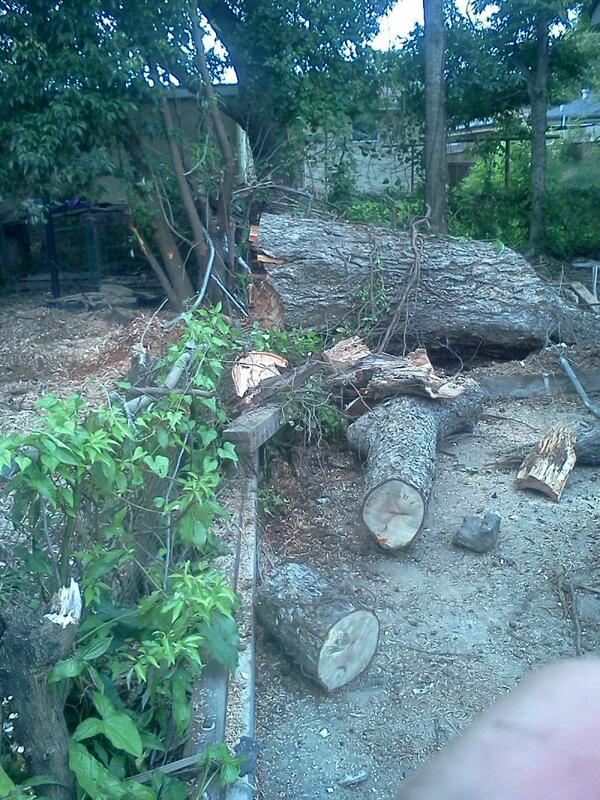 First, I cut away the fence at the edge of the stump and clear the area enough to work safely. Then I grind into the stump to expose the interior obstacles. Using a Sawzall or even a cutting torch if necessary, I cut through the metal and continue grinding. 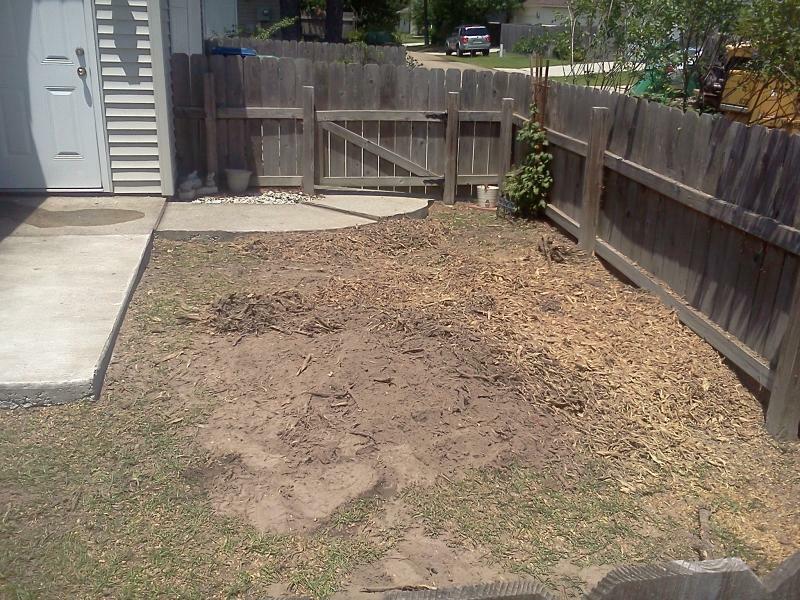 There will be a gap in your fence where the stump was and the area will be suficiently cleared such that the fence can be repaired and the ground can be leveled. My stump has a fence growing through it. I only want it ground back to the fence line without damaging the fence. Can that be done? Again, absolutely YES! We can work the stump to where we have ground it to the fence line without damaging the fence. The wood will still slightly cover your side of the fence and the stump will be cleared from the ground up along that plane. This is a great option when dealing with uncooperative neighbors where a tree was on a property line. It is also a great option for avoiding the expense of fence repair. In the picture below, the neighbor on the left needed the fence line cleared from a tree that was growing on the property line and was knocked down by Hurricane Issac. The property to the right is the back yard of a blighted and abandoned house. I was able to grind all of the offending stump to just beyond the fence line so that my customer could remove the old fence destroyed by the tree and install a new wooden fence. What about large stumps? Can you do those too? I love a challenge! No stump is too large (or too small)! That big ol' stump below makes my 35 horsepower machine look like a toy, but rest assured, my machine and I won! I have a stump that was partially uprooted. What can be done about it? Grind it! This is the best way to get rid of it. The dirt that is stuck to it will fall back into the hole along with the mulch. What else can be done with a stump grinding machine? I have used this machine to till garden beds and dig trenches for French drains. This is especially helpful if there are roots in the path of projects like these. I have also removed roots for contractors laying concrete and even used it to lower the tops of wooden pilings for homebuilders. 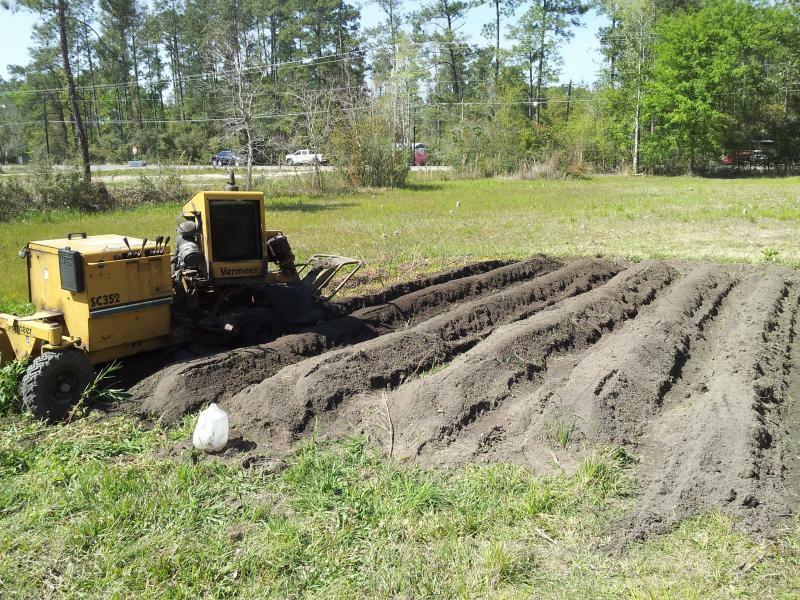 Below is a garden that I plowed with my machine. Note the dirt was reduced to a mere powder! To the left, this is the "business end" of a Stump Grinding machine in action. Note the shavings from this pine stump are small and managable. Also note the depth that the stump is being cut. There will be no problem adding dirt and laying sod after this job is done!